5n1 Tropical Combo is a great addition to any party! You can rent this Wet or Dry. This Combo Bounce house features a large bounce area, a basketball hoop, dual ladder climb that leads to a dual lane slide that either ends at a bumper if rented dry or splashes down into a pool if rented wet. If you are renting at a park, you will need to add a generator to power this Combo Bounce House and can only be rented dry. The slides on this combo are 8ft tall. 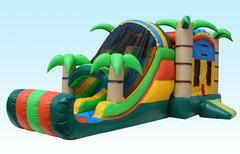 We offer a wide variety of bounce house rentals in addition to our combo bounce house rentals. Be sure to view them all! 2- outlets located within 75ft, we carry and provide ext cords for your rental but for fire safety we do not run over 75ft. Each outlet must be on a seperate breaker switch because of the amps the blowers pull.